When it comes to being in the water, safety is key. Whatever fun water activities you have planned, personal flotation devices (PFDs) are an important part of preparing for water adventures and are absolutely essential for any excursion that involves a boat, kayaks, or other common outdoor activities. Just ahead, we’ll talk a little bit about the different types of PFDs, what key features you should look for in PFDs, and what kind are best for infants, kids, and adults. PFDs are categorized into five different kinds: Type I, Type II, Type III, Type IV, and Type V. Type I, or an Offshore Life Jacket, is a close-fitting life jacket that is best suited for water that is remote, activities far from shore, and where rescue is not speedy. Type I jackets are specifically designed to last for hours in the water and allow for both conscious and unconscious people to be rescued in rough seas or other choppy water. Type I jackets flip users on their back, a key safety feature for almost all PFDs. However, due to its durability, a Type I jacket can be bulky and is generally only recommended for excursions that involve distance, such as boat trips far from shore or in open water. Type II jackets, or Near Shore Buoyant Vests, are a very common type of life jacket used in recreational water activities. Type II jackets are best for close to shore or inland water activities, where rescue is quicker, and people are more easily accessible by rescue teams. They float well, and most turn users on their back, like Type I jackets. Unlike Type I jackets, Type II jackets are not designed for rough water, and are less bulky with greater comfort. This type of PFD is ideal for most boating and other water activities. Type III jackets are another common type of life jacket, good for conscious users engaged in inland water activities. This type of jacket is not ideal for those who have fallen unconscious in an emergency, as they do not flip users on their back upon hitting the water. A user might have to tilt their heads back in order to avoid going face down in the water. That being said, Type III jackets are the most comfortable for general wear. Type IV PFDs are throwable floatation devices, like the kind you would often see on the back of boats. Type IVs are an excellent addition to any of the other type of life vests/jackets. These types of PFDs can appear as cushions, rings, or in a horseshoe shape and are thrown to a person in distress in the water for additional flotation. However, Type IVs are not ideal for unconscious people in distress, or non-swimmers, and are not suitable for rough water. Type V PFDs are special use devices for specific activities. These vests will have instructions for their use on the device, and if instructions are not followed properly, may be less safe. These PFDs are best for continuous wear and may be better suited for cooler weather or areas. The most important information to keep in mind when selecting a PFD is that PFDs must be certified by the US Coast Guard. There will be a mark on the label from the Coast Guard stating as such. Safety is the most vital part of any water activity, and without a Coast Guard label, a PFD is not guaranteed to be safe in an emergency. When choosing a PFD, there are a few other safety tips to keep in mind. One is that all PFDs, especially when buying for a child or infant, should be tested first. The best place to test a PFD is in a swimming pool, with adequate adult supervision. Children and infants should wear the PFD in the pool and be gently placed face down in the water. If the PFD is working correctly, they will be flipped onto their back. If they do not flip onto their back during this test, do not use the PFD, and find another that will work correctly. Safety first! Another key safety tip to keep in mind with PFDs is fit. PFDs should fit snugly and should not be loose in any places. On way to test for fit in infants and children is to have them raise their hands over their head. If the PFD hits their chin or ears, it is likely to be too big to be for safe use. By contrast, the PFD is too tight if the user cannot breathe comfortably, and a new size should be chosen. It might be your first instinct to size up when purchasing a PFD, but that may lead to a too loose fit, and therefore would be unsafe. When it comes to buying a PFD, there are several factors to keep in mind. One is the activity you will be engaging in. Unless you plan on going into deep, open water, a Type I PFD is not necessary. The most common and useful PFD for general water activities is a Type II jacket. When choosing a PFD for an infant or small child, the best ones are Coast Guard approved, have a flotation collar that keeps their head above water, and has a grab loop to hang onto in case the child falls into the water, and can be quickly recovered. If you are looking for a PFD for a younger child or infant, a crotch strap adds an additional safe fit that helps keep baby secure in the water. In the end, though PFDs are absolutely essential for any water activity, one of the best ways to be safe in the water is to be a strong swimmer. 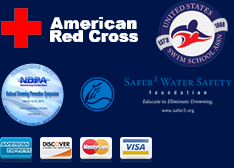 Swimming lessons are a great way to get both kids and adults comfortable in the water, and self-sufficiency is key in any sort of water-related emergency. Keep in mind that some PFDs are made for swimmers and having adequate swim skills boosts the effectiveness of PFDs. Safety always comes first in any water activity, and the safest way to participate in water fun is to have swim skills as well as a fitted PFD appropriate for the activity. Swim safe. Swim fast. Have fun!